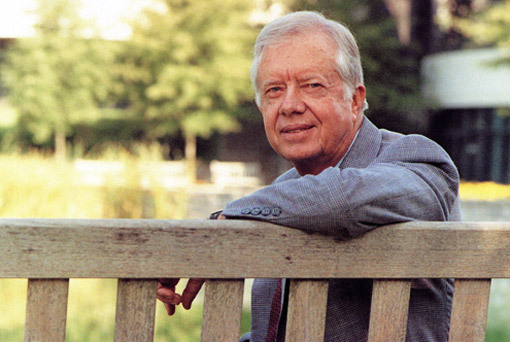 James Earl “Jimmy” Carter, Jr. is the only Georgian to have served as President of the United States. He was born in Plains, Georgia. Carter graduated from the U.S. Naval Academy at Annapolis and served in the Navy for 7 years. In 1954, he resigned from his Navy commission and returned to Plains, Georgia to manage his family’s warehouse and cotton gin businesses and a peanut farm. In 1962, Carter was elected to the Georgia senate and was elected governor of Georgia in 1970. During his term as governor, he reorganized the state’s executive branch, eliminating the number of government agencies from 300 to 25. He also had an impact on Georgia’s court system: he engendered a unified approach to the courts and changed the selection of judges to a merit process. Governor Carter appointed the first woman as a state judge. He created the Georgia Heritage Trust, which functions to preserve Georgia’s natural and cultural resources. Governor Carter expanded special education, vocational education, and pre-school education. Additionally, he expanded state mental health services for Georgians. At the end of his term in 1976, he informed Georgians that he would be a Democratic candidate for the presidential nomination. Carter defeated President Gerald R. Ford in November of 1976 and served only one term. As President, he created a national energy policy, completed major civil service reforms, expanded the national park system, deregulated the trucking and airline industries, and developed the Department of Education. Carter’s presidency, however, suffered mightily from national economic problems: inflation and interest rates were high. When Carter tried to lower inflation and interest rates, those efforts led to a short-term recession. In foreign policy, he will most likely be known for negotiating the 1978 Camp David Peace Accords between Israel and Egypt, which was the first peace treaty between Israel and an Arab neighboring state. President Carter was able to get congressional ratification of the Panama Canal treaties and established full diplomatic relations with China. After Russia invaded Afghanistan in December of 1979, he withdrew the United States from the 1980 Summer Olympics in Moscow and increased aid to Pakistan. He also advocated for human rights across the world. In November of 1979, militants seized control of the U.S. Embassy in Iran and held 52 Americans hostage. Those 52 Americans were held captive for 14 months. Iran didn’t release them until 1981—on the day Carter left office. The horrible economy and the mishandling of the 52 American hostages greatly contributed to his defeat in 1980. He lost in a landslide to President Ronald Reagan. After his defeat to President Reagan, Carter returned to Georgia and he became active in negotiating peace, fighting diseases, and ensuring fair elections across the globe. He’s playing an instrumental role in Habitat for Humanity’s efforts to build economical housing. You listed your answers on the wrong article, but I understand that your responses are in reference to the previous article. All answers are correct, except #1. The correct answer is A. Thanks for your participation in the previous quiz.